Brandi Carlile is the big winner coming out of the 2019 Grammy Awards Premier Ceremony, where some 70+ awards are handed out ahead of the telecast version of the awards show, including the Americana, bluegrass, folk, and blues awards. Brandi Carlile won Best American Roots Performance for “The Joke,” as well as Best Americana Album for By The Way, I Forgive You. She also won Best American Roots Song, which is a songwriters award she shares with Dave Cobb, Phil Hanseroth and Tim Hanseroth—a.k.a. ‘The Twins” who make up her band. Dave Cobb and Shooter Jennings also share in the accolades as producers of By The Way, I Forgive You. This makes Brandi Carlile three for three with the six nominations she is up for on the night. The three other awards she is up for are the all-genre Song of the Year and Record of the Year for “The Joke,” and Album of the Year for By The Way, I Forgive You, all of which will be given away during Sunday night Grammy telecast. It could be a very big night for Brandi Carlile, and Americana music by proxy. Other winners in the American roots categories included The Travelin’ McCourys for their self-titled album for Best Bluegrass Album, The Punch Brothers and All Ashore for Best Folk Album, Buddy Guy and The Blues Is Alive and Well for Best Traditional Blues Album, and Fantastic Negrito and Please Don’t Be Dead for Best Contemporary Blues Album. Country awards handed out during the pre-telecast include “Butterflies” by Kacey Musgraves for Best Country Solo Performance, Best Country Song for Kacey Musgraves’ “Space Cowboy,” and “Tequila” by Dan + Shay for Best Country Duo/Group Performance. Willie Nelson also won Best Traditional Pop Vocal Album for his Frank Sinatra tribute, My Way. Make sure to stop by Saving Country Music during the Grammy Awards telecast for the Saving Country Music LIVE blog. I’m overall neutral when it comes to Carlile – she’s shed her skin too many times. But, I’m routing for her. I’m hearing a ton of great about the new Tayna Tucker album Carlile produced and had a hand in writing every song. I feel a big night for her will be a big boost to the Tucker album. When she first hit the scene she was indie rock, then she shifted to alt-country, now she’s Americana. Last time I saw her in concert was in 2012 and I really liked her set because I thought it was rootsy and country-grounded …. something that was missing in her albums (IMO). She’s an artist always evolving. But, I’ve never been able to pin point her style. I think you kind of buried the lead here Trigger. Meant to Be was left high and dry for country duo or group song!!!!!!!! The best country song of the year was a Kacey Musgraves song? Really? God these awards are a joke. I could name about 1000 better songs than the one of hers that won. Starting off with every song from Pat Reedy’s album That’s All There Is. But god forbid a real country artist like him would get recognized. You should have seen the other nominees. Nice pre-Grammy piece about Brandi in The Guardian. She comes across as a complex and real person. I like Brandi and By The Way I Forgive You is a good album. But me thinks Brandi winning Americana Album of The Year for it and Best Americana Roots Song for The Joke has more to do with the Grammys overarching efforts to ensure more inclusiveness with female and gay performers in this year’s awards than the actual best album and song. Especially when it beat John Prine’s best album in years. But hey…that’s just my opinion…your results may vary. 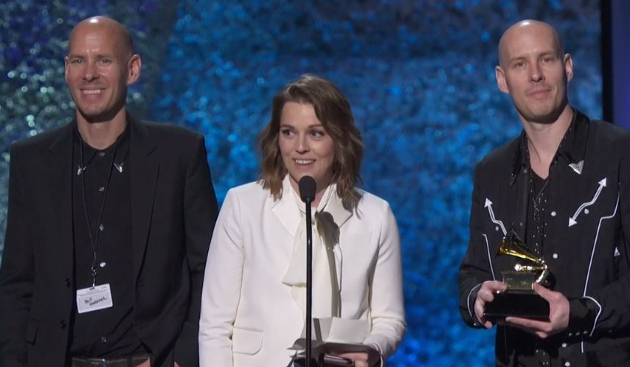 Brandi Carlile slayed the Grammys, win or lose. Congrats for Brandi. She is so talented. By The Way, I Forgive You is good album. Its well deserved. You are exactly correct. Reminds me of the Dixie Chicks win for their “Taking The Long Way”. The Grammy’s are always about making a statement. Especially as the statements lean towards the liberal side. I predicted Brandi would win because of this. Was an easy prediction. NO WAY was the Grammy’s not going to reward that. By the way, my statements have nothing to do with her music itself. Much the same can be said for the Grammy nods. I have never been so utterly and thoroughly disappointed as I am with “By the Way, I Forgive You”…..a boring, meandering, painfully tuneless mess. Shooter’s sparse Lanoisuque production only makes the whole affair that much more bleak.